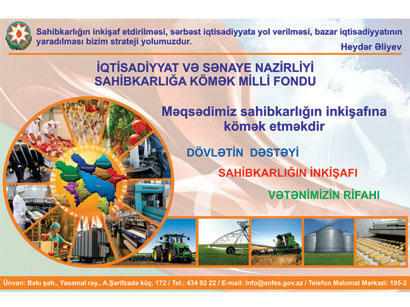 The National Fund for Entrepreneurship Support (NFES) under the Economy Ministry of Azerbaijan has begun accepting investment projects on priority development areas in the Balakan District, the Economy Ministry said in a message on December 4. The NFES considered it expedient to start accepting proposals of entrepreneurs on financing start-ups as well as investment projects to create gardening and tobacco-growing facilities, tobacco curing chambers, facilities for processing tobacco, hazelnut and milk, manufacture of bread and dried fruits, silkworm cocoon reception and processing points, as well as a hotel. Entrepreneurs can apply to the Fund through authorized credit organizations. Small projects can be fully financed through concessional loans. About 150 million manats will be issued in preferential loans to entrepreneurs in 2017.